If you're a fan of relaxed dressing when it comes to your personal style, you'll love this incredibly chic pairing of a beige fleece gilet and navy skinny jeans. You could perhaps get a little creative in the shoe department and spruce up your getup with Salvatore Ferragamo Knee Length Boots from farfetch.com. 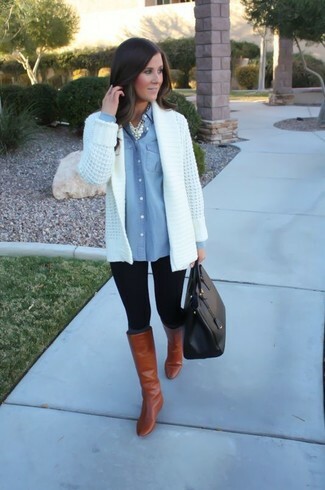 If you're on the lookout for a casual yet seriously chic outfit, try pairing a grey quilted vest with navy skinny jeans. As well as very comfortable, both of these items look fabulous together. Sporting a pair of tobacco leather knee high boots is an easy way to add some flair to your getup. For functionality without the need to sacrifice on good style, we love this combination of a black leather biker jacket and charcoal skinny jeans. Throw in a pair of Salvatore Ferragamo Knee Length Boots to take things up a notch. For a cool-meets-stylish outfit, make a beige coat and a brown check pencil skirt your outfit choice — these two items fit beautifully together. When it comes to footwear, this look is round off nicely with Salvatore Ferragamo tobacco leather knee high boots. If you're all about functionality dressing when it comes to your personal style, you'll love this seriously stylish pairing of a white knit open cardigan and black leggings. For shoes, go down the classic route with Salvatore Ferragamo Knee Length Boots. Such items as a beige coat and tan skinny pants are the perfect way to inject some sophistication into your daily rotation. Round off this look with tobacco leather knee high boots. This combination of a black coat and black leather leggings is super easy to throw together and so comfortable to sport all day long as well! 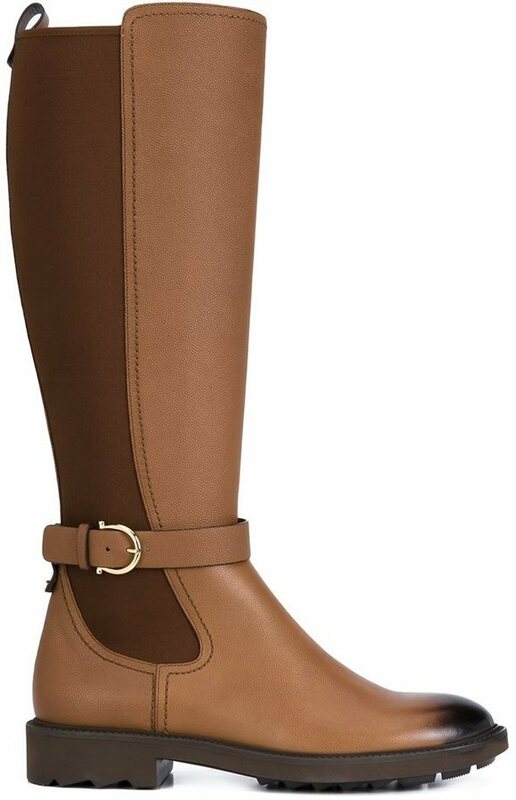 To add oomph to your ensemble, complement with Salvatore Ferragamo tobacco leather knee high boots. This combination of a grey knit open cardigan and blue skinny jeans is super easy to do and so comfortable to sport as well! Got bored with this getup? Enter Salvatore Ferragamo Knee Length Boots to shake things up. Marry a white and black horizontal striped crew-neck sweater with light blue ripped denim shorts for a lazy day look. You could perhaps get a little creative when it comes to footwear and elevate your getup with Salvatore Ferragamo Knee Length Boots from farfetch.com.